It seems it’s not just the FA who make strange decisions when it comes to cup competitions. 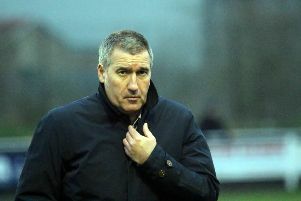 The OFA has come under fire from Banbury United boss Mike Ford following Wednesday’s OFA Senior Cup semi-final. Jack Finch’s first goal for the club booked United a place in the final against either Oxford City or North Leigh. But Ford was critical of the OFA’s decision to stage the semi-final with Ardley United at Kidlington, where his side won 1-0 thanks to Finch’s second half winner. Ford told Puritans Radio: “It was horrible, the pitch was such a leveller but credit to Ardley, they were excellent. “This is the semi-final of the OFA’s marquee competition and the pitch made it an awful spectacle. The game was spoiled by the state of the pitch and that is not a criticism of anyone. “The OFA seriously have to look at why we played here instead of Oxford City or at the ground of the team pulled out of the hat first. If Oxford City beat North Leigh then the final will be at their ground, on a 3-G surface which they play on every other week and that would give them a massive advantage!